Yesterday was our annual Thanksgiving dinner with our friends – Friendsgiving as it’s been dubbed by some. I’ve lost count of how many years we’ve all been getting together and enjoying this meal but it’s got to be at least six or seven now, which is so unbelievable to me! It’s a potluck style meal and every year there are at least 20 of us in attendance (I think it was closer to 25 this year). Turkey, mashed potatoes, stuffing, tons of veggies, mac & cheese, pies, cupcakes – you name it, it’s probably on the table at Friendsgiving. The first few years we attended Shane and I were on mashed potato duty, mostly because that’s about all we knew how to cook at the time 🙂 As we’ve gotten more comfortable in the kitchen over the years, we’ve branched out and done appetizers, stuffing, side dishes and tons of desserts. This year we shared this bacon-jalapeño cheese ball, a sweet potato casserole (it was good, but needs some tweaks before I blog it) and also this pumpkin pie with brown-sugar walnut topping. Preheat oven to 350 F with a rack in the bottom third of the oven. Roll the dough into about a 12-inch round. Transfer to the pie plate. Trim away the excess then fold the edges under and crimp them. Place the crust in the freezer for 20 minutes. Spray a sheet of aluminum foil with nonstick cooking spray then use it (sprayed side down) to line the crust. Fill with dried beans or pie weights. Bake for about 20 minutes, or until the crust is set. Remove the pie weights and the foil carefully then return the crust to the oven and bake for about 10-15 minutes, or until the edges are golden brown. (If bubbles form, just use the back of a spoon to gently press them down.) Transfer the pie plate to a wire rack and allow the crust to cool. To make the filling: In a large bowl, whisk the brown sugar, eggs, salt, cinnamon, ginger, and cloves together until well combined – make sure there are no brown sugar lumps. Add the pumpkin puree and heavy cream and whisk until incorporated. Pour the filling into the crust and transfer the pie to the oven. Bake for 40-45 minutes, or until the filling is firm (it will still jiggle, but if you touch it, it shouldn’t be wet). Remove the pie from the oven and reduce the oven temperature to 325 F. Sprinkle the topping evenly over the surface then return to the oven. Bake for an addition 15-20 minutes, or until an instant-read thermometer inserted in the center registers 175 F. Transfer the pie to a wire rack and allow to cool completely. 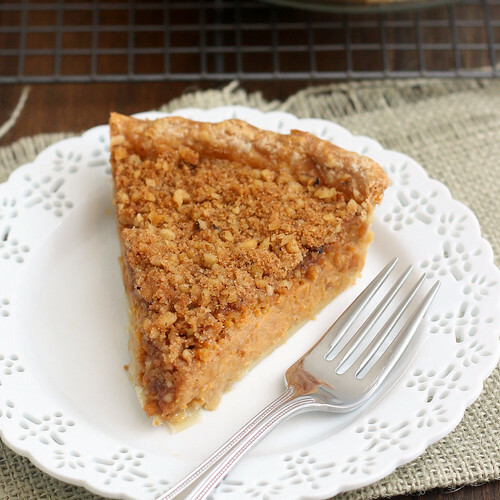 16 Responses to "Pumpkin Pie with Brown Sugar-Walnut Topping"
Gorgeous! And I love the idea of a Friendsgiving! So fun! Wow! This might be the first time ever I wish my dad would make a different kind of pumpkin pie. His is so stinking wonderful but I would love to have this topping on it. Maybe I can convince him to add it. Possibly my two favorite things about Thanksgiving are my first after-dinner turkey sandwich and a slice of cold pumpkin pie. It might be heretical to say it, but walnuts make my tongue itch. I wonder how I would like pistachios in their stead. I actually have to bake a ‘plain’ pumpkin pie for my daughter’s school this year and I have been trying to push the ‘plain’ envelope and this one looks like it could work! Minus the nuts, allergies and can’t use them, but oats will work! NOw this is my kind of pumpkin pie. That topping is perfect. I’m not really a fan of regular pumpkin pie, but love this! 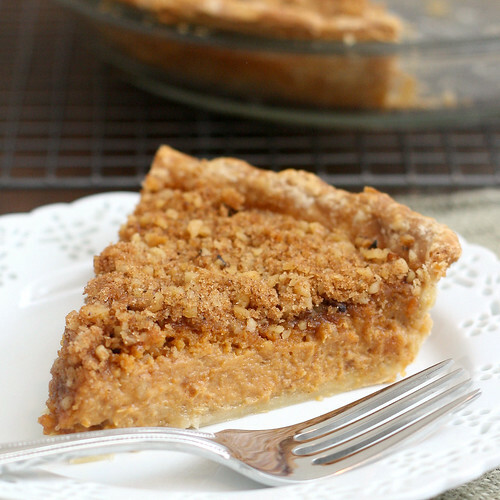 Great way to make pumpkin pie even more delicious! Your friendsgiving sounds like so much fun. I am curious about the sweet potato casserole, as I am thinking about making one for Thanksgiving, but haven’t decided on a recipe. BTW I hadn’t had a chance to comment, but I loved the boiled apple cider recipe and subsequent treats made from it. I have thought about buying the boiled apple cider from KAF a couple times, but have been too frugal to pull the trigger. I bought some cider and will make it as soon as I have a chance. 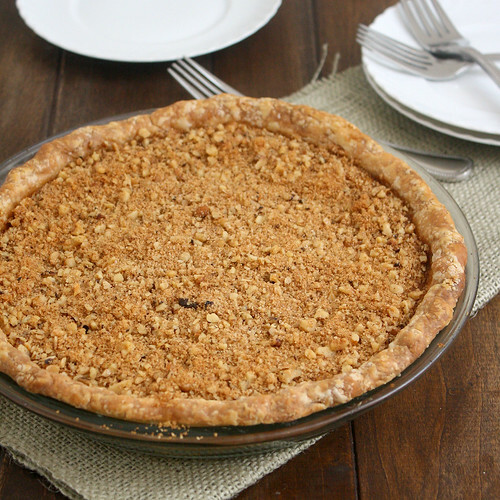 I’m not very fond of pumpkin pie, but my love of streusel might make this worth a try anyway. =) Your Friendsgiving sounds like a really cool event. I love this! Such a great spin on traditional pumpkin pie. Isn’t it so hard to stick to basic recipes these days?! Love the topping! Beaaaaautiful. I love the topping!! I made this for Thanksgiving this year and it was awesome! Super tasty filling and the topping gave it some extra oomph. Everyone loved it. Oh my gosh! I need to make this this Thanksgiving! It looks SO yummy!!!!!! Thanks for the recipe!